Webster, Gloria Cranmer. 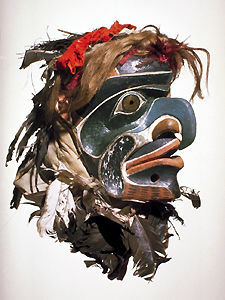 "Kwakwaka’wakw (Kwakiutl)". The Canadian Encyclopedia, 16 October 2018, Historica Canada. 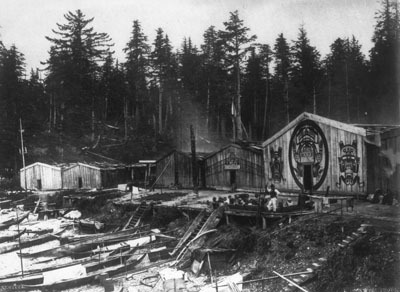 https://www.thecanadianencyclopedia.ca/en/article/kwakiutl. Accessed 23 April 2019. The Kwakwaka'wakw peoples are traditional inhabitants of the coastal areas of northeastern Vancouver Island and mainland British Columbia. In the 2016 census, 3,670 people self-identified as having Kwakwaka’wakw ancestry. Archaeological evidence shows habitation in the Kwak’wala-speaking area for at least 8,000 years. Before contact with Europeans, Kwakwaka'wakw fished, hunted and gathered according to the seasons, securing an abundance of preservable food. Consequently, this allowed them to return to their winter villages for several months of intensive ceremonial and artistic activity. 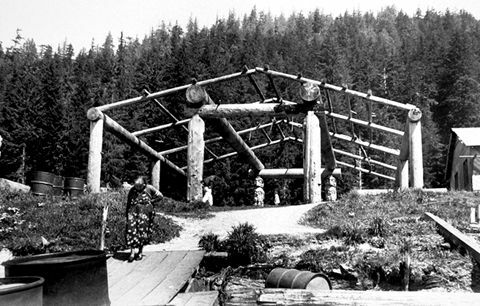 In addition, trails across Vancouver Island made trade possible with Nuu-chah-nulth	villages on the west coast of the island. 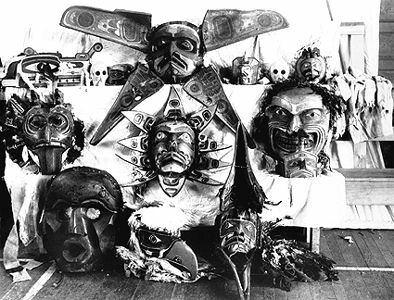 Confiscated masks and other goods that belonged to the Kwakwaka'wakw (Kwakiutl) people who attended Dan Cranmer's potlatch in 1921 at the village of Alert Bay, Northwest Territories. This dance is being performed at a southern Kwakwaka'wakw village on Quatsino Sound. Elaborate theatrical performances were an important part of Northwest Coast Indigenous life. Wood interior house post, Hops Island, BC, Kwakwaka'wakw (Kwakiutl). Wood Hawk Spirit mask, Alert Bay, BC, Kwakwaka'wakw (Kwakiutl). 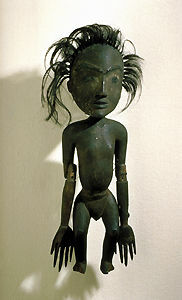 Wood sculpture, possibly Kwakwaka'wakw (Kwakiutl), British Columbia. 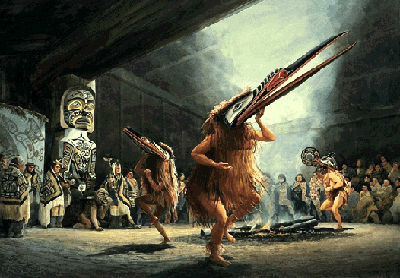 The culture of the Kwakwaka'wakw is similar to that of their northern neighbours, the Heiltsuk and Oowekyala peoples. The potlatch, for example, is a ceremony that the Kwakwaka'wakw and some other Indigenous nations in British Columbia have been hosting since well before European contact. Though it was once outlawed by the Indian Act, the potlatch remains an important part of modern community life. The Kwakwaka’wakw are known for their artwork, distinct from other Northwest Coast Indigenous art in its style and cultural significance. 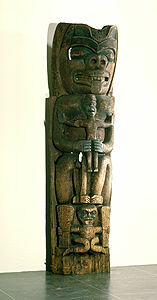 In the carving of totem poles, for example, the Kwakwaka’wakw are known to carve creatures with narrow eyes, whereas the Haida	poles typically have bold eyes. A member of the Wakashan language family, Kwak’wala is related to other Indigenous languages in British Columbia, such as those of the Nuu-chah-nulth (Nootka), Heiltsuk	(Bella Bella), Oowekyala and Haisla (Kitamaat). The Kwak’wala language is considered endangered;today, most Kwakwaka'wakw children speak English	as their first language and there are few fluent speakers. In 2016, Statistics Canada reported 585 Kwak’wala speakers (though this figure does not specify their fluency level), with the majority living in British Columbia (98.3 per cent). As a means of preserving the language, some schools in the area sponsor programs in Kwak’wala. In 1792, Spanish explorers Dionisio Alcalá-Galiano and Cayetano Valdés, and British Captain George Vancouver encountered most of the south Kwakwaka'wakw groups. Farther north, in 1849 the Hudson's Bay Company established Fort Rupert, which operated until about 1877, when it was sold to Robert Hunt, the fort’s last factor (trader). George Hunt, Robert's son, worked with anthropologist Franz Boas, and together they recorded a large body of material on the language and culture of the Kwakwaka'wakw. 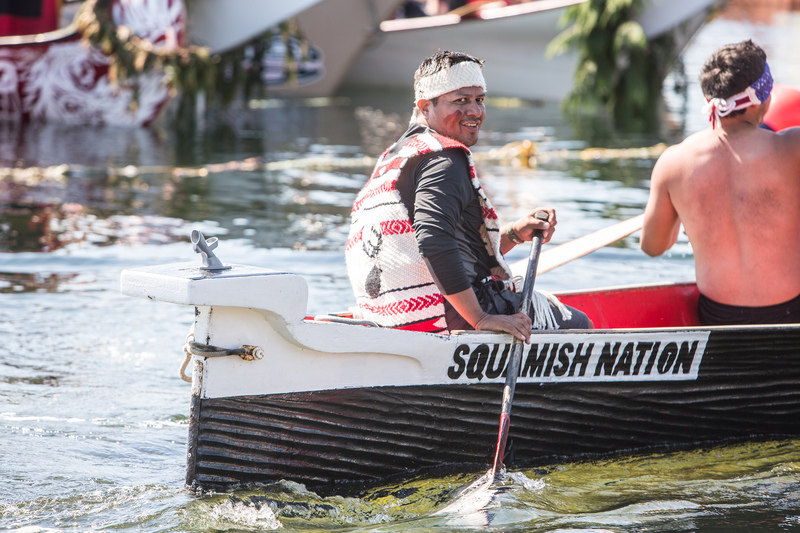 Traditionally fishers, the Kwakwaka'wakw continue to fish commercially in a highly-competitive industry. 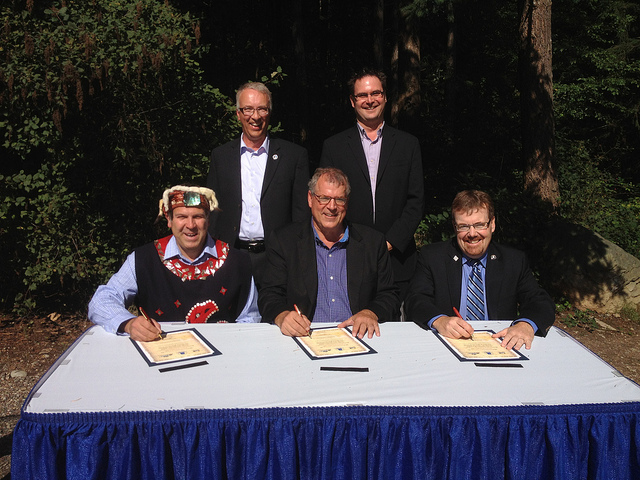 Hereditary chiefs still pass on rights and privileges at potlatches, but band	government is conducted by elected councillors. A number of original villages have been abandoned as inhabitants have moved to communities such as Alert Bay, Campbell River	and Port Hardy to be closer to schools and hospitals. Founded in 1980, the U'mista Cultural Society works to ensure the survival of Kwakwaka’wakw cultural heritage. Located in Alert Bay, U'mista operates a museum and cultural education facility. H. Codere, ed, Kwakiutl Ethnography (1966). F. Boas, "The Social Organization and the Secret Societies of the Kwakiutl Indians," Smithsonian Institution Annual Report for 1895 (1897); H. Codere, ed, Kwakiutl Ethnography (1966); Aldona Jonaitis ed, Chiefly Feasts: The Enduring Kwakiutl Potlach (1991). F. Boas, "The Social Organization and the Secret Societies of the Kwakiutl Indians," Smithsonian Institution Annual Report for 1895 (1897). Aldona Jonaitis ed, Chiefly Feasts: The Enduring Kwakiutl Potlach (1991). U’MISTA CULTURAL SOCIETY Visit the official site of the U’mista Cultural Society to learn more about the Kwakwaka’wakw people. LIVING TRADITION Explore this virtualmuseum.ca site to learn more about Kwakwaka’wakw history and culture. The site also includes a virtual tour of the U’mista Cultural Centre as well as educational tools.